Yemen, officially the Republic of Yemen, is an Arabic country located at the far south of the Arabian peninsula. Yemen was originally created from a set of states and tribes. The Ottoman Empire annexed its West part, including North Yemen and Aden in 1538. In 1839, the British Empire overtook Aden and progressively built the Aden protectorate by signing agreements with various emirates, sheik states and sultanates. Aden protectorate was a part of the British Indies until 1937 when in became a colony by itself, the Colony of Aden. The protectorate was unformally divided in Western and Eastern protectorates for administrative reasons. Some states kept minting their own money. In 1918, the Ottoman Empire came to an end. Imam Yahya Muhammad declared North Yemen an independent state. He created the Mutawakkilite Kingdom of Yemen and got international recognition. This kingdom became the Yemen Arab Republic (North Yemen) in 1962, in the aftermath of the Nasserist revolution. Aden Protectorate independence happend in several steps. From 1959 to 1962, the British Empire created the Federation of Arab Emirates of the South, which initially included six states and later extended to the West. It became the Federation of South Arabia in 1962. Four states refused joining the Federation of Arab Emirates of the South and created the Protectorate of South Arabia. 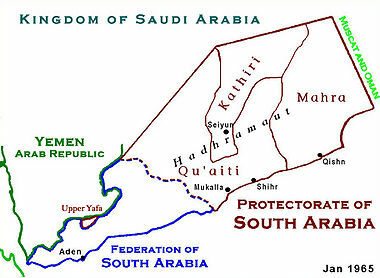 The Federation and Protectorate united in 1967, creating the People's Democratic Republic of Yemen (South Yemen). In 1990, the Yemen Arab Republic and the People's Democratic Republic of Yemen united and become the Republic of Yemen. Yemen uses the Yemen rial which divides into 100 fils. People's Democratic Republic of Yemen used the dinar divided in 1000 fils. Mutawakkilite Kingdom used the rial, divided in 160 zalat, 80 halala ou 40 buqsha. One rial equaled one Maria Theresa thaler. The honorary lettering Imadi was used during the rulings of Imam Yahya et Ahmadi and Imam Ahmad. The term "Imadi rial" or "Ahmadi rial" is sometimes used. Yemen Arab Republic kept the rial divided in 40 buqsha until 1974 when it switched to the decimal rial (100 fils). Aden protectorate, part of the British Indies, used the rupee divided in 100 paisa or 16 anna. Yemen uses the Islamic calendar. An hawk shows on Yemen Arab Republic coins. This republic was part of the United Arab States along with the United Arab Republic which was the union between Egypt and Syria from 1958 to 1961 (Egypt kept the name until 1971). The Hawk was then the symbol of the Federation of Arab Republics from 1972 to 1977, the same hawk logically showing on Egypt and Syria coins. Notice that the Yemen hawk has a specific triangular form.